It’s a day which could mark the Second Coming itself. But for many Christians, the night of October 2 holds no special significance. The “Feast of Trumpets” or Rosh Hashanah, begins then. It marks the start of the Jewish New Year and is celebrated by the sounding of a shofar, a ceremonial instrument made out of a ram’s horn. 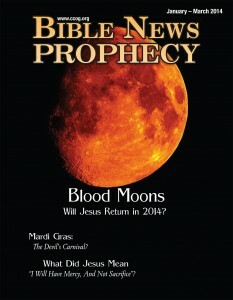 Mark Biltz, the discoverer of the ‘blood moons’ phenomenon and the author of the explosive new book “God’s Day Timer: The Believer’s Guide to Divine Appointments,” argues the Feast of Trumpets will someday mark the beginning of the tribulation. The Feast of Trumpets or Rosh Hashanah is occurring soon, but there is a whole series of biblical feasts which have prophetic significance, according to Biltz. 24 In the seventh month, on the first day of the month, you shall have a sabbath-rest, a memorial of blowing of trumpets, a holy convocation (Leviticus 23:2,24, NKJV throughout except as noted). Notice that the Bible teaches that Jesus will come on the last trumpet blas. As Christians, we can draw comfort from these words of the New Testament. Will that actually be on the Feast of Trumpets? Possibly, though that is not certain. We do not yet know when this final trumpet will be blown yet, but it will be to announce Jesus’ return. Anyway, the Fall Holy Days are almost upon us as the Feast of Trumpets runs from sunset October 2nd through sunset October 3rd in 2016. To learn more about the Feast of Trumpets, here is a link to a sermon I made yesterday that many will listen to on the Feast of Trumpets in 2016: The Last Trumpet and the Book of Life. The Book of Life and the Feast of Trumpets? Are they related? Is so how? If not, where not? Here is a link to the sermon: The Last Trumpet and the Book of Life. Feast of Tabernacles’ Sites for 2016 This is information on the planned Feast of Tabernacles’ sites for the Continuing Church of God in 2016. The Feast in 2016 begins the evening of October 16th. This entry was posted on Sunday, September 25th, 2016 at 7:30 am	and is filed under Prophecy, Religious News.